Famous people born on NOVEMBER 29 are Sagittarius who are not very tolerant. They don’t like to wait. They’re pretty open about what they think, too. However, they are sometimes not very mindful of other people’s feelings when they say what’s on their mind. In spite of this, they manage to make and keep a number of friendships. Some people think they’re heartless because of it though. This couldn’t be further from the truth. 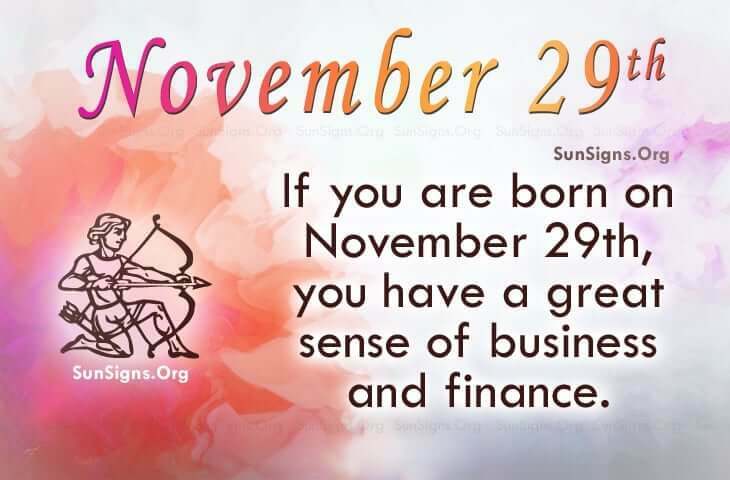 The famous celebrities born on November 29 have a great sense of business. When they see an opportunity for success, they jump on it. Usually, they set goals and meet them within a timely manner. Sometimes they doubt themselves and their ability to have the things they want in life. They need to put those negative thoughts out of their mind. Famous people born on November 29 have the potential to do more things than they think possible. When it comes to their health, they may experience some pains simply because they stress a lot. Additionally, they can from time to time suffer with depression. When they are depressed, it shows. They have a tendency to not want to shave or honestly, they just let themselves go to waste. For famous people born on NOVEMBER 29th, honesty is their best policy. This could be a negative for someone on the other end of a candid conversation with them. This personality trait makes them a good candidate for someone in the law enforcement field or when dealing with national affairs.